LENGTH X WIDTH X HEIGHT: 166.6 x 74.2 x 66.5 in. 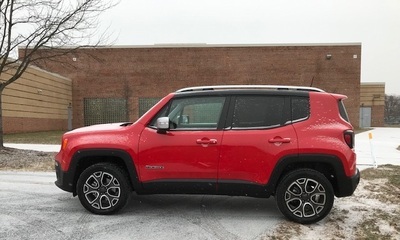 BOTTOM LINE: It may carry the Jeep name, but unless you choose the off-road optional Trailhawk version, the Renegade is really a Fiat 500X and as such serves only to detract from the classic Jeep name. The Jeep Renegade is a nice size for a compact SUV. And that may be one of the few positives for this unfortunate vehicle. Under the hood, the Made In America engine is positively awful. It is noisy on acceleration (noisier than most sports cars but less intriguing) and noisy on general cruising. Inside the cabin you have the choice of listening to the sound system (a $1,245 UConnect option) at high volume or communicating with other passengers, but not both. The noise is bad enough, but the engine runs out of poop at about 4,000 rpm, so if you’re expecting better performance at the top end of the rev range, it isn’t there. Fuel economy is also disappointing for a small engine. That’s the bad news. The worse news is that the optional engine is a 1.3-liter turbo four which develops 177 hp (132 kW / 179 PS) and 200 lb-ft (270 Nm) of torque. That engine comes standard on the Renegade Limited and Trailhawk, but it is also available on the Sport and Latitude. Renegade is a twin to the Fiat 500X, but with Jeep styling rather than Fiat 500 styling. In theory, it could be a nice enclosed smaller Wrangler. The final assembly point for the Renegade is the Fiat plant in Melfi, Italy. Hence, the Renegade is also saddled with an enormous $1,495 destination charge. Another bad option is the “dual pane panoramic power sunroof at $1,595. Okay, you want a Wrangler experience, so you get a sunroof to mimic the sides-and-top-off experience of the Wrangler. The good options are $995 for the Advanced Technology Group (automatic high beams, full speed collision warning, lane departure warning and a rear park assist system). The $895 Safety and Security Group includes the blind spot monitor and rear cross traffic alert plus high intensity headlamps among other things. Oh, and there’s no spare. Renegade’s ride is Jeep-like, meaning hard. Despite comfortable front seats and a heating system that did a good job against winter freeze, overall ride comfort wasn’t great. The fat wheel is heated, and the heat remains on the next time you start up. That was a pleasant surprise, since with many cars, simply finding the heated wheel switch every time is a chore. Cargo capacity is good for a small SUV. We used the Renegade of a trip to Costco and had cargo room to spare. The rear hatch is easy to lift without being too light. 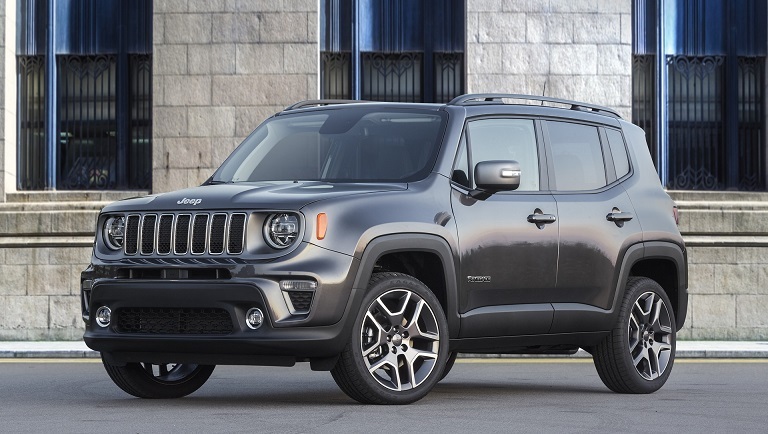 Renegade has a tight turning circle which made handling in tight spaces, such as parking lots, a pleasure. I have to confess I was disappointed with the Renegade. Styling is very Jeep-like with, for example, headlight and taillight designs mimicking each other. But the noisy and poor performing engine detracts from the few good features. The Most In-Depth Independent Jeep Vehicle Consumer Research - Anywhere!